The book is a blend of biography and bibliography that traces the emergence and development of the specialist book literature on concrete at a time when reinforced concrete was a new technology. From 1897, and the first complete building of reinforced concrete in the UK to 1935, when the literature mushroomed and the basic technology was understood and codified. 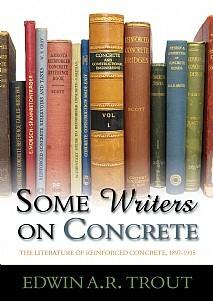 Some Writers on Concrete contains the biographies of significant figures from the UK and USA, in the development of concrete technology and provides comprehensive bibliographical coverage of their work published in book form. These include Oscar Faber, C.E. Reynolds, F.M. Lea, C.A.P. Turner, G.A. Hool and Harvey Whipple. It collates the work of numerous writers to form a corpus of literature and engender an understanding of the unfolding narrative of concrete theory and practice. The emergence of specialist organisations aiming to develop the use of concrete took a similar path over this period with the creation of bodies such as the Concrete Institute, the Concrete Utilities Board and the Reinforced Concrete Association which was founded in 1933. In the USA the pattern was similar with the establishment of the Portland Cement Association (PCA) and American Concrete Institute (ACI). The book will appeal to those with an interest in the development of technical knowledge, and the lives of the engineers who embodied that development, namely civil and structural engineers, students of engineering, librarians, bibliographers, those engaged in the concrete industry and the history of engineering and construction.